Well....well-de-well well well....the Carolina Panthers have just become the first team in NFC South history to win back-to-back division titles! At "only" 7-8-1, they obviously have a losing record, but to the haters and doubters? NYAAHH!!! We all know Cam is healthy and playing his best football after a death-defying car accident which inspired him, and by extension, the rest of the offense. The team is peaking at JUST the right time and Arizona Cardinals coach, Bruce Arians (whom I really like), is no fool. He knows his defense is in for a fight with Cam and rumor has it the Cards' defense has trouble with dual-threat QBs. Who is starting for the Cards at QB? That would be Ryan Lindley. Just because the name doesn't ring a bell nearly like Quasimodo's face does, it doesn't mean he's not capable. He threw his first two NFL TD passes last week along with 316 yards in last week's loss to the San Francisco 49'ers. However, he also threw three INTs and should have had a fourth while going against a defense that scored 14 points last week. Jonathan Stewart is healthy and productive for the first time in ages, and it couldn't have come at a better time. Mike Tolbert can't be completely forgotten either, having shown his own power-running ability is in top form after he, also, recovered from injuries to contribute to this stretch run. The Cardinals have small but quick Andre Ellington to catch passes and run outside and little behind him other than a fellow named Kerwynn Williams. Neither RB tilts the scales at 200+ pounds and running up the middle should be a challenge for the 'Cards this week. Kelvin Benjamin and TE Greg Olsen both broke the thousand-yard receiving barrier last week as they each wound up with the exact same total: 1008 yards. Benjamin hasn't yet reached his potential and his counterpart rookie, UFA Philly Brown, has really started to show signs of being a threat this past month. Jerricho Cotchery is a possession-type WR and the team's most accomplished and precise route-runner at the position, so he could see some of those quick-timing/short-window comebacks or quick-out throws underneath from Cam. Other than Kelvin, the Panthers have no above-average, established threats at the position and Brown is by default the team's "deep speed threat." The same can NOT be said for the Arizona Cardinals. They have likely future HOF receiver Larry Fitzgerald, who can rightly blame QB play if he doesn't make the Hall in another 10-12 years (you have to be retired for 5 full seasons to be considered). Even so, he was tops in catches with 63 on the team and second in yardage with 784. Michael Floyd led the team in yards (841) and TDs (6) while John Brown's body lies a-moulderin' in the grave respectably with a 48-696-5 line...not to be confused with teammate Jaron Brown. Jaron's body is just one foot in the practice squad with the other on a banana peel. "Moulderin'" Brown may "only" be a rookie from Pittsburgh State, but he out-produced our Philly Brown rookie. Fitz and Floyd together are a lethal pair and Moulderin' Brown only makes it worse for opposing defenses. 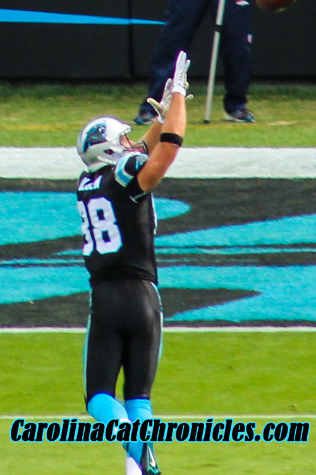 Obviously, with Greg Olsen (finally!) being acknowledged as one of the best in the business, the Panthers' TE1 is a top-five guy behind a very select few like Jimmy Graham and Rob Gronkowski. I can't think of a more consistent, productive TE year in and year out than Graham, but Olsen is right there - he's just not an explosive, flashy player like the uber-athletic Graham is. He also doesn't command Graham's salary, either. The Cards have a bunch of no-names and their top producer, John Carlson, has about 350 receiving yards. Ed Dickson could push him to start if he were there. Not a contest. Here's where things get interesting, since the defense is the strength of both these teams. Even without Greg Hardy, the Panthers have one of the top D-lines in the NFL, and WITHOUT having a monster DT stomping on players' ankles which seems to be not a theme but a requirement for playing the D-line in Detroit. I must say NFL.com has some interesting ideas about the Cards' O-line. Apparently, they play the 3-4 with 2 DTs and one DE, much like a small school plays 4 guards and a forward in college basketball. Well...those three guys the Cards start are Calais Campbell, Dan Williams and Frostee Rucker (Mike's Evil Twin). Campbell has 7 sacks, and out of the 3-4 that translates into more like 14 if he were the DE in a 4-3. The linemen in a 3-4 are block-eaters that allow athletic linebackers to stay free to make the plays, so necessarily, 3-4 linemen won't have the "stats" 4-3 DL get. Campbell's one of the best in the business for sure. Dan Williams has played all 16 games for the first time in his 5-year career, and Rucker has had a decent year himself with 5 sacks. They've got a nice mix of production in there along with sucking up blocks, which is a very nice bonus. Underestimating this group would be a bad thing to do. TD and Luke, I have said many times, are as good an inside/outside LB combo as exists in the NFL, but the Cards have a very nice group of four starters, themselves: Sam Acho and Alex Okafor (8 sacks) seal the outside and were teammates at the University of Texas, while Larry Foote and and Kevin Minter (Mike's Evil Twin) plug the inside. Foote's the older guy; Minter the younger one. The four play near-seamless football and while only Okafor is an accomplished pass-rusher, nobody in Carolina's LB corps is...although TD and/or Luke CAN do it if asked but it's not a big part of the scheme. Certainly, Arizona's Fatal Foursome gives this defensive unit "punch," but it's the back four that help hold down coverage to make the front-seven even better than they would be with an average group of DBs. I just can't go against the NFC's DROY, Defensive MVP, and Comeback Player of the Year. Tony Jefferson and Tyrann Mathieu are about as prototypical at each position as any NFL team has. Jefferson does the run defending and body-crunching hits and generally cleans up the back end of the play should it reach him while Mathieu has shed his "Honey Bear/don't-give-a-care" college monicker, grown out of his love for marijuana (or so it appears thus far), and has been quite a nice find for the Cardinals. It doesn't hurt that he has ex-LSU teammate Patrick Peterson to help keep him in line and show him the NFL ropes...just in case Tyrann had any "ideas." Now, Mathieu is becoming one of the better free safeties in the NFC. Carolina's safeties are the defense's weakness no matter whom they put back there. DeCoud and Harper are simply warm bodies and Tre' Boston is enthusiastic but inexperienced. Carolina's current duo of Josh Norman and Bene "The Fed Chief" Benwikere are long on talent and athletic ability but short on experience (Bene) or self-control (Josh). In another year, Carolina's pair of corners could begin to approach the level of play that Arizona's biggest defensive strengths are with Patrick Peterson and Antonio Cromartie. In fact, it would be surprising if it were the other way around, considering both starting CBs for the Cards are first-round draft picks. The Carolina Panthers are happy on any given return either way if nothing "bad" happens for them. That's considered a victory in Charlotte. Arizona has OUR Ted Ginn, Jr. returning kicks and punts. The Arizona Cardinals are unhappy on any given return either way if nothing "good" happens for them. Peterson is their second-string returner. I think that sums things up pretty well. Drew Butler has put more than two punts per game inside the opponent's 20 yard line (34) while Brad Nortman has 26. Nortman's gross punting average is a couple of yards higher than Butlers, but his net is about the same amount lower. This reflects the poor punt coverage on the part of the Panthers' special teams and falls under that category I listed above. Returns aside, Butler is more adept with the coffin-corner punt this season, with the same 5 touchbacks that Nortman has had. Carolina gets the edge in five categories while Arizona gets the nod in five as well with the others being "even." That would seem to call for a very close, tight ball game and I think that's exactly what we'll see this coming Saturday. What I can't predict is what should decide the game - turnovers and big plays on the defensive side of the ball. Arizona's secondary is as good a group of starters as you'll find anywhere overall. At this point, with a healthy Cam and with 'Zona having what....a 5th or 6th string QB in now, if the Panthers defense can continue to play even just a solid game, I think Carolina has more firepower on offense at this point to put them as a solid (6-point, I figure) favorite in this game. During the game - when to PANIC!?!? PANIC if and when the Cards score 17+ points in the first half with little sign from the Panthers defense of slowing them down. The Cardinals offense should be stopping themselves as often as they're being stopped by Carolina's defense. Carolina's offense should be stopped WAY more often by the Cardinals' defensive play than they will stop themselves - a nice turnaround from the six-game slide earlier in the regular season. While a good pass-rush is almost always a good thing, flushing Cam out and forcing him to run isn't always the best idea; he knows he can run and always has that option. When the pass rush gets to Lindley and HE starts hearing footsteps, his track record (as it is for most developing young QBs) is to throw bad passes that can result in turnovers. PANIC if the Panthers start slowly, especially with a turnover. If the Panthers get behind two or more scores and Shula decides to abandon the run waaaay too early (ie: Down ten in the first half). The Cards may not have much firepower on offense but what they lack there, they make up for with a very tough defense. The short answer is when the game is over and the Panthers have more points. It's a cop-out on my part, but it's how I feel. It simply comes from a healthy respect not only for the defensive team we're facing, but in Head Coach Bruce Arians. This guy is gonna take Arizona places - as in back to the Super Bowl - but just not this year. R-E-L-A-X when...the Panthers are up two scores in the first half with the ball, and are moving the chains. R-E-L-A-X when...our pass-rush is getting to Lindley multiple times early and on "easy" passes that are designed to get the QB into a rhythmic groove with his line and receivers and Liindley gets hit a couple of times. Watch his accuracy decrease; that's when you can c-h-i-l-l a tad. Zona DOMINATED us in the desert last season, 22-6. Cam had three picks and the Panthers passed twice for every running attempt. That's the bad news. The good news? The Panthers won their next eight consecutive contests. If they do the same thing this year, the eighth consecutive win will be the Super Bowl. What Are Your Keys to Beating AZ? ?